MEDWEL, Inc., a Portwell subsidiary and leading medical solution provider announced the launch of a new medical grade Panel PC: the MEDS-P1001. Designed for medical applications such as bedside care infotainment terminals, medical equipment HMIs and smart medical monitor interfaces, the MEDS-P1001 comes with Intel Atom® x5-E3930 processor and features a slim fan-less design, for a silent energy-efficient system, that is suitable for a range of applications in the medical care field. The MEDS-P1001 offers exceptional computational efficiency and expandability in a slim, streamlined, lightweight design. The MEDS-P1001 comes equipped with an Intel Atom® X5-E3930 dual-core processor with 1.3GHz clock speed and 6.5 Watt thermal design power (TDP), which allows it to serve as a basic low-power computer terminal for various medical applications and contexts. The MEDS-P1001 is also equipped with low-power SO-DIMM DDR3L memory modules with a clock speed of 1600MHz and a maximum memory capacity of 8GB, while the SSD storage device offers faster read/write speeds and a quicker boot time than conventional hard drives. The display is a 10.1” LCD display with 1280 × 800 resolution (16:10 display ratio) and maximum brightness of 350 lumen paired with, a true-flat projected capacitive (PCAP) touch screen. The external I/O interface has two USB 3.0 ports, one Gigabit Ethernet, one RS-232, one HDMI, MIC-in, Line-out port and power switch. The internal equipment includes a 2W speaker, built-in microphone, 5-megapixel camera module (optional) and Wi-Fi/Bluetooth 4.0 wireless module (Mini-PCIe), while the expansion interface includes one half-height Mini PCIe slot and four USB ports. With its ample I/O and expansion interfaces, computing power built for basic operation, and cost-effective streamlined fan-less modular design, the MEDS-P1001 is well suited for use as a bedside care infotainment terminal, medical equipment HMI, and smart medical monitor interface. The water resistant, dustproof IP65 design offers increased protection, ensuring that the touchscreen display provides users with clear and convenient operation. 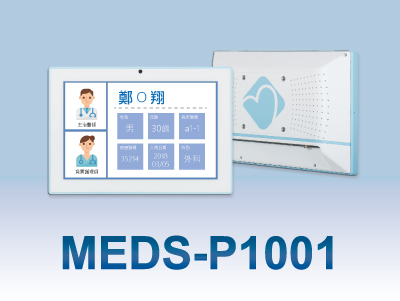 The MEDS-P1001 antibacterial, alcohol-resistant plastic housing, waterproof and dustproof true-flat touch screen design, and compliance with IEC 60601-1, and FCC Class B certification standards ensure its safety and dependability in medical and healthcare applications. The safety of patients, operators and the equipment’s operational reliability are the essential requirements for any healthcare IT device. As a professional medical grade touchscreen PC for medical and healthcare applications, MEDS-P1001 is built to provide users with highly efficient computing power, stable operation, and quality you can count on.